Yesterday, filmmaker Taika Waititi shared one final set video from the last day of principal photography on Marvel's Phase Three adventure Thor: Ragnarok. The director gave fans a tour of the set, along with some special guests, Thor himself, Chris Hemsworth and Tessa Thompson, who plays Valkyrie. Neither of the actors were in costume while this video was streaming on Facebook Live, but today we have what may be the final set photos from production, revealing our first look at the full Valkyrie costume, along with a few brief set videos as well. Twitter user Bigr1g posted these photos recently, along with videos featuring a number of actors in costume as Sakaar warriors walking to the set. As for the Valkyrie photos, we don't get a completely unobstructed view of the costume, since she is standing behind a number of different objects on the set. Still, these photos reveal that the costume will be at least somewhat faithful to the comic book rendition, since there are a number of similarities between the movie costume and the comics costume. Now that production has wrapped, hopefully Marvel will start unwrapping the package in an official manner. Last month, director Taika Waititi dropped a very interesting tidbit, teasing that the character Daryl Jacobson (Daley Pearson), Thor's roommate from a popular short film that Taika Waititi directed, may have a cameo in Thor: Ragnarok, but that hasn't been confirmed. Ever since the short film debuted during Marvel's Comic-Con panel, fans have even started a petition to have Marvel develop a Netflix series about Thor and his roommate Daryl. In the absence of any official plot details, a number of rumors have surfaced throughout the production. One of the most prominent rumors revealed that Thor will be banished from Asgard after his nefarious brother teams up with the new villain, Hela (Cate Blanchett), who destroys his mighty hammer Mjolnir. This reportedly sends Thor on a quest that brings him to a gladiator planet, where he is forced to face the current champion, Hulk (Mark Ruffalo). There have been rumors that certain aspects of the iconic Planet Hulk comic will be utilized for this story, although it isn't a direct adaptation of that comic. Thor: Ragnrok stars Chris Hemsworth as Thor, Tom Hiddleston as Loki, Anthony Hopkins as Odin and Idris Elba Heimdall, who all return from Thor and Thor: The Dark World. 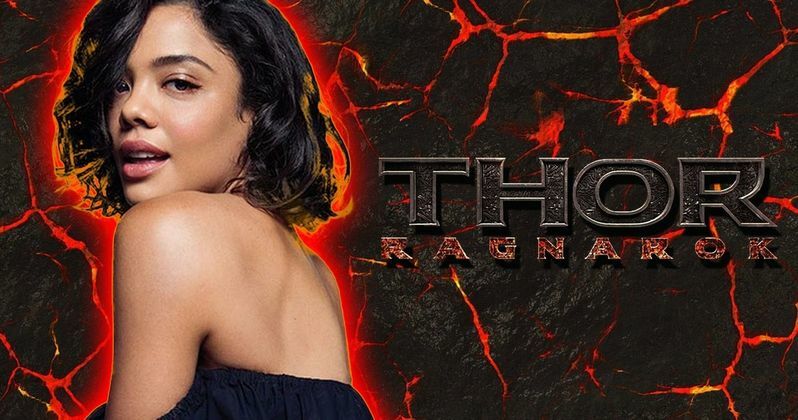 This sequel will also bring new cast members into the fold such as Tessa Thompson (Valkyrie), Cate Blanchett (Hela), Karl Urban (Skurge) and Jeff Goldblum (The Grandmaster). Take a look at the photos and videos from the final day of production on Thor: Ragnarok, as we now begin the countdown to its release on November 3, 2017.